Does your child have a flat spot? This beautiful baby girl has been adjusted since birth. Not because she was in pain, not because she had “problems”, but because her parents understand how important and delicate a child’s developing nervous system is. Specially trained pediatric chiropractors (such as ourselves) are trained to find and remove any interference to this system, which has been shown to have a massive impact on the health of kids like her. 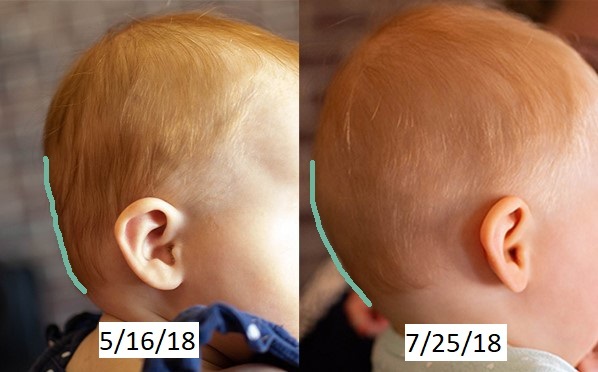 We noticed after a few months that she was developing a flat spot on the back of her head. This is a relatively common occurrence in kids that parents are often told they will “grow out of”. These flat spots can be caused by the bones in their head not lining up properly, their head not being able to rotate freely, or a variety of other things. We used specific and extremely gentle adjustments to her spine, the bones in her head, and inside her mouth. With these adjustments we were able to make the changes that you can see in this picture and it only took a couple months of consistent care. Thank you to the parents like these that believe in the potential of the human body. Thank you for allowing us to make a positive impact in your kids. It is our life’s passion to help as many kids as possible. If you’re a parent that is wondering why so many people now take their kids to a pediatric chiropractor regularly, we are happy to show you more! Contact us today for an appointment.